مهرداد شکریه, محمود, قاجار, محسن, سلامت طلب, مظاهر, معدولیت, رضا. (1394). مدل‏سازی آسیب پیش‏رونده در چندلایه‏های کامپوزیتی با در نظر گرفتن اثرات هم‏زمان مکانیزم‏های تخریب درون و برون لایه‌ای. علوم و فناوری کامپوزیت, 2(2), 1-8. محمود مهرداد شکریه; محسن قاجار; مظاهر سلامت طلب; رضا معدولیت. "مدل‏سازی آسیب پیش‏رونده در چندلایه‏های کامپوزیتی با در نظر گرفتن اثرات هم‏زمان مکانیزم‏های تخریب درون و برون لایه‌ای". علوم و فناوری کامپوزیت, 2, 2, 1394, 1-8. مهرداد شکریه, محمود, قاجار, محسن, سلامت طلب, مظاهر, معدولیت, رضا. (1394). 'مدل‏سازی آسیب پیش‏رونده در چندلایه‏های کامپوزیتی با در نظر گرفتن اثرات هم‏زمان مکانیزم‏های تخریب درون و برون لایه‌ای', علوم و فناوری کامپوزیت, 2(2), pp. 1-8. مهرداد شکریه, محمود, قاجار, محسن, سلامت طلب, مظاهر, معدولیت, رضا. مدل‏سازی آسیب پیش‏رونده در چندلایه‏های کامپوزیتی با در نظر گرفتن اثرات هم‏زمان مکانیزم‏های تخریب درون و برون لایه‌ای. علوم و فناوری کامپوزیت, 1394; 2(2): 1-8. در این تحقیق، شروع و پیش‏روی آسیب در چندلایه‌های کامپوزیتی AS4/PEEK با سوراخ مرکزی تحت بار کششی درون صفحه‌ای با استفاده از تحلیل اجزا محدود بررسی شده است. به‌منظور بررسی شروع آسیب در لایه‌های کامپوزیتی از معیارهای هشین استفاده شده است. همچنین به‌منظور تعیین مکانیزم‌های گوناگون تخریب درون صفحه‌ای مدل آسیب پیش‏رونده هشین در چندلایه‌های کامپوزیتی مذکور استفاده شده است. مدل‌سازی شروع و رشد تورق در بین لایه‌های کامپوزیت با استفاده از مدل ناحیه چسبناک صورت گرفته است. در این تحلیل، شبیه‌سازی‌ها با به‌کارگیری نرم‌افزار آباکوس انجام شده که تمامی مدل‌های تخریب استفاده شده نیز در آن موجود است. نکته قابل توجه در این روش این است که با استفاده از معیارهای تخریب به‌طور هم‏زمان تمام مکانیزم‌های تخریب درون صفحه‌ای و همچنین تورق مدل شده‌اند. مقایسه نتایج عددی مدل اجزاء محدود حاضر، با نتایج آزمایشگاهی محققین دیگر نشان می‌دهد که با به‌کارگیری مدل ناحیه چسبناک به‌منظور شبیه‌سازی تورق، می‌توان منحنی بار-جابه‌جایی استخراج شده در آزمایش مذکور را با دقت بیشتری پیش‌بینی نمود. همچنین الگوهای آسیب درون لایه‌ای و بین‌لایه‌ای بین لایه‌ها، به‌دست آمده از مدل حاضر، در حین بارگذاری ارایه شده است. In this study, initiation and evolution of damages in AS4/PEEK laminated composites with center open hole under in-plane loading are investigated using finite element analysis. Hashin failure criteria are used to obtain the damage initiation of composite laminates. In addition, in order to capture the various in-plane failure mechanisms in this laminate, Hashin progressive damage model, which is an energy based model, is used. As delamination is one of the most critical damage mechanisms in composite materials, initiation and propagation of delamination in the mentioned laminate are modeled utilizing cohesive zone model. In order to simulate progressive damages of laminated composites, Abaqus software is used and all applied damage models are available in this commercial software. It is worth to note that, in the proposed model, interlaminar and intralaminar damages are considered simultaneously. Comparison of the present numerical results and experimental ones shows that by using the cohesive zone model to simulate the delamination, experimental load-displacement curve can be predicted more accurately. Also different in-ply damages and delamination patterns that obtained by the proposed model are presented to clarify different damage mechanisms in composite materials..
 Chen, J. F. E. Morozov, V. and Shankar, K., “Simulating Progressive Failure of Composite Laminates Including in-Ply and Delamination Damage Effects,” Composites Part A: Applied Science and Manufacturing, Vol. 61, pp. 185–200 2014. Maa, R. H. and Cheng, J. H., “A CDM-based Failure Model for Predicting Strength of Notched Composite Laminates,” Composites Part B, Vol. 33, No. 6, pp. 479–489, 2002. Chen, J. F. Morozov, E. V. and Shankar, K., “A Combined Elastoplastic Damage Model for Progressive Failure Analysis of Composite Materials and Structures,” Compos Struct, Vol. 94, No. 12, pp. 3478–3489, 2012. Farrokhabadi, A. Hosseini-Toudeshky, H. and Mohammadi, B., “Development of a Damage Analysis Method in Laminated Composites Using Finite Fracture Toughness of Single Lamina,” Mech Adv Mat Struc, Vol. 20, pp. 177–188, 2013. Sadeghi, G. Hosseini-Toudeshky, H. and Mohammadi, B., “An Investigation of Matrix Cracking Damage Evolution in Composite Laminates – Development of an Advanced Numerical Tool,” Composite Structures, Vol. 108, pp. 937–950, 2014. Lubineau, G. and Ladeveze, P., “Construction of a Micromechanics-based Intralaminar Mesomodel, and Illustrations in ABAQUS/Standard,” Computational Materials Science, Vol 43, No. 17/18, pp. 137-145, 2008. Shokrieh, M. M. and Ghajar, M., “Simulation of Mode I Strain Energy Release Rate for Laminated Composite Using a Simple Finite Element Model,” In Persian, Majlesi Journal, Vol. 3, No.4, pp. 1-8, 2010. Torabizadeh, M. A. Shokrieh, M. M. and Fereidoon A., “Progressive Damage Modeling of Glass/Epoxy Laminated Composites under Static Load at Low Temperature,” In Persian, Journal of Modeling in Engineering, Vol. 8, No. 21, pp. 33-43, 2010. Rybicki, E. F. and Kanninen, M. F., “A Finite Element Calculation of Stress Intensity Factors by a Modified Crack Closure Integral,” Eng Fract Mech, Vol. 9, No. 4, pp. 931–938, 1977. Ramamurthi, M. and Kim, Y. S., “Delamination Characterization of Bonded Interface Using Surface Based Cohesive Model,” in Supplemental proceeding of TMS 2012 141st Annual Meeting & Exhibition, Volume 1: Materials Processing and Interfaces, John Wiley & Sons, Inc., Hoboken, NJ; pp. 289–296, 2012. Hallett, S. R. and Wisnom, M. R., “Numerical Investigation of Progressive Damage and the Effect of Layup in Notched Tensile Tests,” J Compos Mater, Vol. 40, No. 14, pp. 1229–1245, 2006. Camanho, P. P. Dávila, C. G. and de Moura, M. F., “Numerical Simulation of Mixed-mode Progressive Delamination in Composite Materials,” J Compos Mater, Vol. 37, No. 16, pp. 1415–1438, 2003. Pinho, S. T. Iannucci, L. and Robinson, P., “Formulation and Implementation of Decohesion Elements in an Explicit Finite Element Code,’ Composites Part A, Vol. 37, No. 5, pp. 778–789, 2006. Borg, R. Nilsson, L. and Simonsson, K., “Simulation of Delamination in Fiber Composites with a Discrete Cohesive Failure Model,” Compos Sci Technol, Vol. 61, No. 5, pp. 667–677, 2001. Tserpes, K. I. Papanikos, P. and Kermanidis, T., “A Three-dimensional Progressive Damage Model for Bolted Joints in Composite Laminates Subjected to Tensile Loading,” Fatigue Fract Engng Mater Struct, Vol. 24, No. 10, pp. 663–675, 2001. Atas, A. Mohamed, G. F. and Soutis, C., “Modeling Delamination Onset and Growth in Pin Loaded Composite Laminates,” Compos Sci Technol, Vol. 72, No. 10, pp. 1096–1101, 2012. Daudeville, L. Allix, O. and Ladeveze, P., “Delamination Analysis by Damage Mechanics: Some Applications,” Compos Eng, Vol. 5, No. 1, pp. 17–24, 1995. Alfano, G., “On the Influence of the Shape of the Interface Law on the Application of Cohesive-zone Models,” Composites Science and Technology, Vol. 66, pp. 723–730, 2006.
 de Morais, A. B. and Pereira, A. B., “Application of the Effective Crack Method to Mode I and Mode II Interlaminar Fracture of Carbon/Epoxy Unidirectional Laminates,” Composites: Part A, Vol. 38, pp. 785–794, 2007. 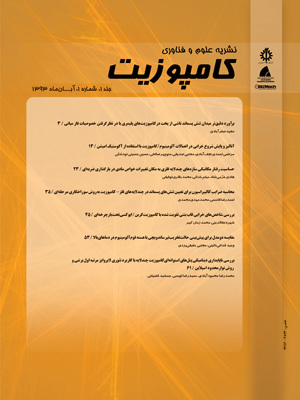 Shokrieh, M. M. Salamat-Talab, M. and Heidari-Rarani, M., “Numerical Analysis of Mode I Delamination Growth in Laminated DCB Specimens Using Cohesive Zone Models,” In Persian, Modares Mechanical Engineering, Vol. 13, No. 1, pp. 38-48, 2013. Heidari-Rarani, M. Shokrieh, M. M. and Camanho, P. P., “Finite Element Modeling of Mode I Delamination Growth in Laminated DCB Specimens with R-curve Effects,” Composites: Part B, Vol. 45, pp. 897–903, 2013. Shokrieh, M. M. and Zeinedini, A., “Prediction of Strain Energy Release Rate of Asymmetric Double Cantilever Composite Beam in Mixed-mode I/II Delamination using Equivalent Lay-up,” In Persian, Modares Mechanical Engineering, Vol. 13, No. 13, pp. 214-225, 2014. Saeedifar, M. Fotouhi, M. Mohammadi, R. Ahmadi Najafabadi, M. and Hosseini Toudeshky, H., “Investigation of Delamination and Interlaminar Fracture Toughness Assessment of Glass/Epoxy Composite by Acoustic Emission,” In Persian, Modares Mechanical Engineering, Vol. 14, NO. 4, pp. 1-11, 2014. Abaqus Analysis User’s Manual, Version 6.12-1, Dassault Systèmes Simulia Corp., Providence, RI. Hashin, Z., “Failure Criteria for Unidirectional Fiber Composites,” Journal of Applied Mechanics, Vol. 47, pp. 329–334, 1980. Naghipour, P. Bartsch, M. Chernova, L. Hausmann, J. and Voggenreiter, H., “Effect of Fiber Angle Orientation and Stacking Sequence on Mixed Mode Fracture Toughness of Carbon Fiber Reinforced Plastics: Numerical and Experimental Investigations,” Mater. Sci. Eng. A, Vol. 527, No. 3, pp. 509–517, 2010. Pinho, S. T. Robinson, P. and Iannucci, L., “Fracture Toughness of the Tensile and Compressive Fibre Failure Modes in Laminated Composites,” Compos. Sci. Technol., Vol. 66, No. 13, pp. 2069–2079, 2006. Chai, H., “Interlaminar Shear Fracture of Laminated Composites,” Int J Fracture, Vol. 43, No. 2, pp. 117–131, 1990.